Hello everyone, How was your day ?? I know the dresses and women's clothing are not my interests but I would like and hope to bring you more reviews of both women and men products in the near future that will let me have more and different readers! 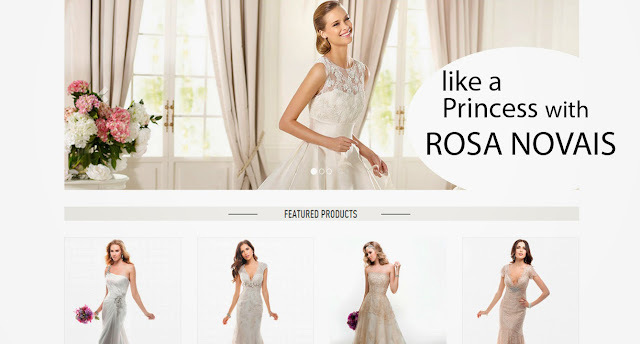 Rosa Novias was founded in 1999, and has become one of the most successful, globally-recognized bridal gowns brands in the world, They are a big online shop and UK based, which sells all kinds ofdresses. kinds of wedding dresses for any theme or color scheme, bridesmaid, mother of the bride, flower girl dresses, and special occasion including prom dresses, evening dress, cocktail dresses, and homecoming dresses in reasonable price you are never left without ideas and thousands of items to choose from them. All the designs in their website are custom made, including custom measurements, color and style, which helps you get the most perfect fit. It is the type of style that makes everyone happy For anything on these sites, be sure to check the dimensions compared to your own body type. Asian clothing specifications are different than US specifications. I've never heard about it, but I've appreciate the selection so much. You've an amazing blog and I love this post. Great selection and I think you should do more of this kind of post. Keep up the good work and have a lovely day! Beautiful! I especially love the long sleeve, green chiffon dress! Thanks for sharing! You have chosen such stunning dresses; I love all of them, the maxis especially! Great selection, my favorite dress is the second green. Wow, son preciosos! El verde largo me encanta, es precioso. Ohh.. sounds good! I'm surely gonna check out the site for dresses. thanks for sharing this. I love your picks, especially dress #9,So beautiful! I hope you're having an awesome day! The beautiful dress , loved the long black dress . Stunning dresses. I love the teal and blue one the best. As you know, Christian Louboutin Sneakers is a popular brand with red sole shoes for its chic design. I am sure you will fall in love with it at your first sight. very nice dresses , i love it.